Regular and punctual attendance is an important part of a student's legal education. In addition, a student's participation in class affects other students. As a prospective attorney, a student should develop strong habits of regular attendance. For these reasons, the American Bar Association and the Howard University School of Law require regular and punctual class attendance. In addition, some Bar examiners require the Dean to certify that a student has regularly attended classes before they allow a graduate to sit for a bar examination. “Regular attendance” in a course means attending at least 85 percent of scheduled classes during the course of the semester. The percentage of absences is intended to account for the range of minor illnesses, family obligations, interviews, and unplanned events that occur. Clinics and externships may define “regular attendance” as requiring more than 85 percent of scheduled classes if that definition is clearly set forth in the course syllabus. Absences due to curricular and co-curricular requirements will not be counted if the absence is due to an unavoidable scheduling conflict which neither the professor nor the student controls and the notice requirements set forth below are satisfied. Examples of curricular and co-curricular requirements that might cause the type of conflict to which this provision applies include, inter alia, emergency court appearances, moot court competitions, and mock trial competitions. If an absence is due to a scheduled curricular or co-curricular requirement, then the student must ask the professor of record for the class with the curricular or co-curricular requirement to notify the professor of record for the missed class in writing before the absence. 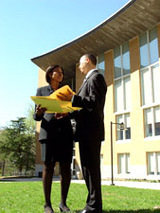 If an absence is due to an unscheduled or emergency curricular or co-curricular requirement, then the student must ask the professor of record for the class with the curricular or co-curricular requirement to notify the professor of record for the missed class in writing within 48 hours of the absence. Absences due to religious holidays will not be counted if the student notifies the professor(s) before the absence(s) of the student’s intention to miss class because of a religious holiday.